In recent years due to high levels of pesticides many bees have become endangered, all are at risk. Many estimate bees have plummeted by upwards of 30%, others say it is much higher. You can take action in your own backyard by planting items that bees are likely to visit. Bees are natural pollinators, without them we would no longer have some of our favorite flowers, fruits and vegetables. 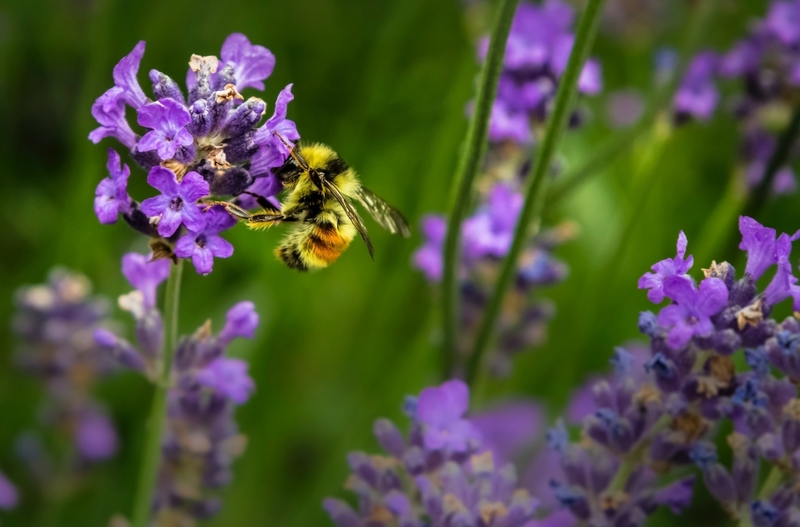 When planting to attract bees, be sure to stay clear of chemicals. Pesticides are designed to kill insects, so by default you are also killing the bees. By staying organic you will provide a safe and natural habitat for the pollinators. North and South Carolina have more than 500 native bee species, and there are more than 4,000 species in North America. Native bees are attracted to native plants, so that is a good place to start. Research shows native plants are four times more attractive to native bees. Some examples of native species for WNC and Greenville SC are purple coneflower, aster, bellflower, black-eyed susan, mint, alyssum, poppies, sunflowers, lupine, creeping thyme, lavender, bee balm, great blue lobelia, goldenrod, and many others thrive in gardens and provide food and habitat for native pollinators. Not only will these plants attract bees, but many of them will also attract butterflies and hummingbirds. Bees and other pollinators have good vision to help them find flower and nectar. Bees tend to prefer the blue and violet-colored flowers the most, followed by white and yellow. These color flowers tends to produce far more nectar than flowers of other colors. This allows the bees to harvest more from these plants. Planting your flowers in clumps will attract more pollinators than individual plants scattered throughout the garden. Include different shapes in your flowers. With the diversity of bees, each kind has their favorites. Bees will be different sizes, have different tongue lengths, and will feed on different shaped flowers. Having a variety will provide more benefits for more bees. You can provide housing for bees. Some bees, like mason bees, will build nesting sites in insect holes and hollow stems. These cavity dwellers will also move into bee houses made from bamboo reeds, and holes drilled in wooden blocks. You can also find bee houses for sale at garden shops. Gathering nectar is hard work for bees and they do get thirsty. A bee bath will give them a place to get fresh, clean water. Fill a shallow container with water and several pebbles or twigs for bees to land on while drinking. Make sure to keep the water safe by changing it often and keeping it clean. Bees work all season; so plant items that will bloom in early spring to fall. Enjoy a variety in your garden! Note: while this list specifies the piedmont region, similar eco-systems make it applicable to the mountains as well.